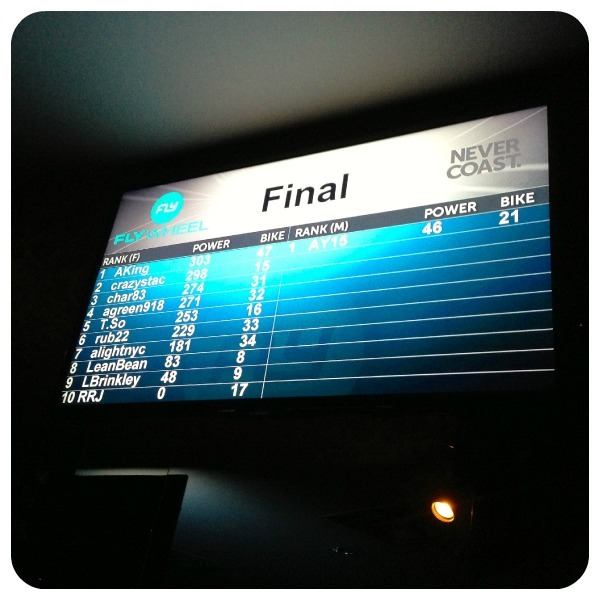 That’s right, I finished fourth on the leaderboard in my latest FlyWheel class! Granted, the class was on the small side, but that’s quite an improvement from my first SWERVE rides class two months ago where I finished 28 out of 35. Now’s the time that I’m thankful for those metrics since the numbers on my scale and my pants size haven’t budged much. Since comparing FlyWheel to SWERVE is apples to oranges, I’ll have to head back to SWERVE soon. In the meantime, I did a 60 minute ride downtown at Drill Fitness. I was dragging a bit on a Sunday morning, but wearing a heart monitor and seeing my numbers on the screen kept my heart in it. (Pardon the pun.) Even though you can slack off during a ride by not pushing yourself as hard as you can or turning your resistance knob down when no one’s looking, staring at your hear rate on the screen shames you into going faster. The teacher I had a Drill was Prozac-happy even though the crowd was hung over, and the facilities are pristine. Plenty of room in the locker room, free shoes, and a smoothie bar. It is tempting to purchase the heart-rate monitor so that I can sync-up with their system and track my progress. And I might if they weren’t so far away. Tribeca is a hike, and FlyWheel is everywhere. I’d love for someone to do some kind of test though to see how accurate the metrics are at all these place. And, I’m kind of jonesing for a metrics-free drumroll ride at Cyc. Located in Tribeca, offers Indoor Cycling and Bootcamp-style, HIIT conditioning classes. Super-solid ride with decent music; complimentary heart-rate monitors and shoes for your ride; beautiful facility with ample room in the lockers and nice showers; smoothie bar; they offer HIIT classes in addition to cycling. Felt a little bit sterile, and the staff could have been friendlier; can’t track your numbers unless you purchase the hear rate monitor from them.